While in exile at the Wartburg Castle, under the protection of Frederick the Wise, Elector of Saxony (1463-1525), Luther began his translation of the New Testament, using the 1516 critical Greek edition by Erasmus. 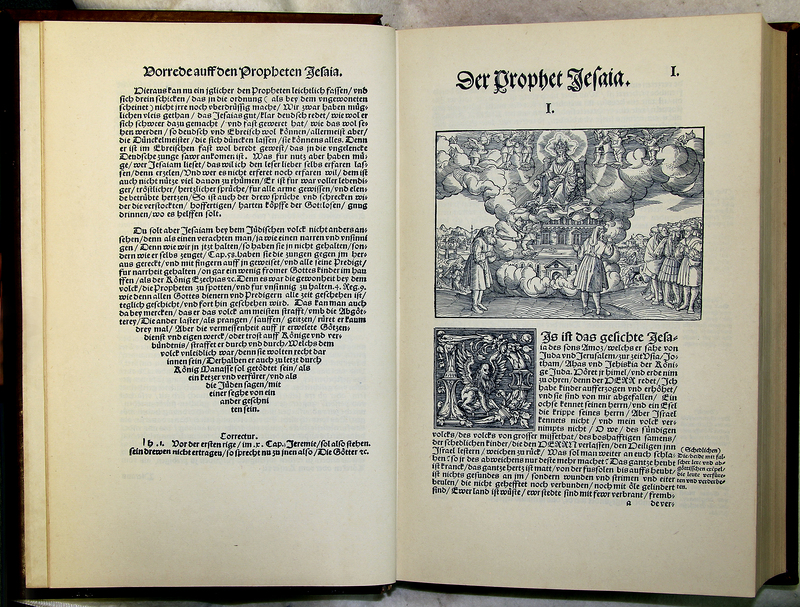 Das Newe Testament Deutzsch was published in September 1522. He then started on the Old Testament and Apocrypha, using a translation committee of friends such as Philip Melanchthon, Justus Jonas, and John Bugenhagen; his ‘Sanhedrin’ (transl. assembly or council). Completed in 1534, the entire Bible was in German – the language of the people. Essentially, with the aid of the printing press, Luther not only helped standardize the various regional dialects, but he also left the German people his greatest achievement. This is a facsimile of the first volume, reprinted in 1935. Translated by Martin Luther, “Die Propheten Alle Deutsch [The Bible], (Wittenberg: Hans Lufft, 1534),” ourheritage.ac.nz | OUR Heritage, accessed April 26, 2019, http://ourheritage.ac.nz/items/show/10345.